When it comes to knowing what good blood pressure is, you may need to have your blood pressure tested. It has been said that the perfect blood pressure is 120/80, but this can vary from person to person. Our blood pressure goes up and down all day and this depends on our activities and lifestyle. So to determine what your natural good blood pressure numbers are, you will have to perform tests over the course of a few days and assess the average numbers. Blood pressure is actually the pressure inside of the blood vessels. These vessels carry blood to all areas of the body and to your vital organs. They should be able to stretch out and contract to aid in blood circulation. For a number of reasons, the blood vessels can become smaller and unable to stretch. This is when high blood pressure can occur. Blood vessels branch out like small tree limbs and supply blood to organs like the heart or kidneys. When you are in a relaxed state your blood pressure will go down. The numbers associated with blood pressure appear to look like a fraction. The first number is known as the systolic pressure. The systolic pressure measures the blood pressure as your heart is beating. The next number is called the diastolic pressure and it measures blood pressure that comes between heart beats. If you have been told that you have high blood pressure, you will have to discuss how to lower it with your doctor. He can give you an indication of what it causing it and how to control it. But there are a few reasons for high blood pressure such as heredity and disease that cannot be controlled. Most of the time high blood pressure can be reduced by a change of lifestyle. Nicotine, lack of exercise and tension can raise blood pressure. So to return to a good blood pressure, you may have to change or eliminate certain things from your daily routine. High blood pressure numbers start at 140/90. But just because you experience a count this high once, it may not be cause for alarm. You have to maintain this number for three full days to make sure you have a problem. You may have consumed too much salt or had extreme tension on that particular day. 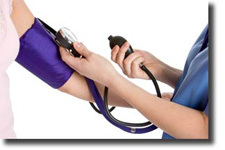 To insure that you do not have high blood pressure, you will have to test yourself for 2 or more days. As a person ages the blood vessels can lose elasticity and they can become hard. Consuming too much fat or cholesterol can clog the blood vessel walls and they can also become blocked. This is called atherosclerosis. When this occurs the heart has to compensate by pumping harder to try to get the blood flowing through the vessels. This can take a toll on the heart because it will not be able to keep pumping so hard. When the heart can no longer pump the appropriate amount of blood through the vessels, congestive heart failure can occur. High blood pressure can have a negative effect on any area that does not receive enough blood flow. For example, if the blood and oxygen flow to the brain is affected, a person can begin to have functioning problems. A swollen blood vessel can also rupture inside of the brain causing either a stroke or bleeding on the brain. Good blood pressure is important for overall good health. If you are experiencing high blood pressure you will need to find out how to adjust it. High blood pressure may not negatively affect the body for many years but once it does it may be too late to do anything about it.